OSHA Compliant. ASTM C-144. You see it on our bags but what does it mean? OSHA Compliant. ASTM C-144. We put this language on our polymeric sand bags but what does it actually mean? In this blog post, we’ll explain how our products were tested and why it’s important to you as the end user. Quality is our strength. That’s our tagline at Alliance and we take it seriously. From the research and development stages all the way through final testing, we strive to deliver the highest quality hardscape products on the market. And quality extends beyond the performance of the product … it means we also take the necessary steps to ensure they’re safe for you to use. 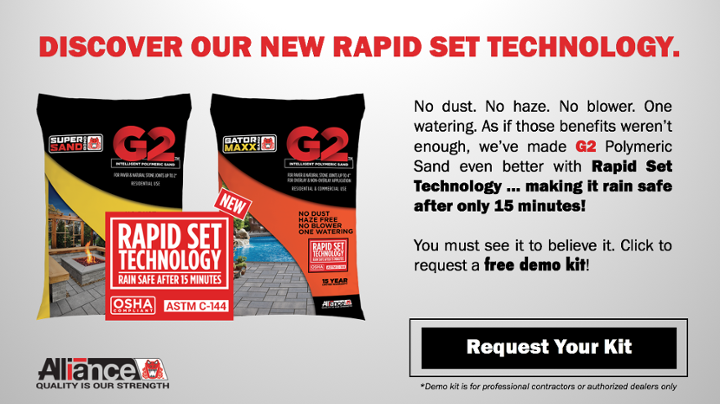 All of the colors in our Supersand, Supersand G2, Maxx, and Maxx G2 product lines have been tested by a third-party to ensure they meet OSHA’s Respirable Crystalline Silica (RCS) Standard for Construction. To test our polymeric sand products, true field installations were performed by a third-party. This included pouring, sweeping, compacting, as well as blowing for the older versions of our sand. Contractors wore monitoring devices during each application to collect any respirable particles and the results were analyzed by a third-party engineering test lab. In conclusion, in all cases the Alliance Designer Products polymeric sand products are significantly below the OSHA Respirable Crystalline Silica (RCS) exposure limit. ASTM C-144 is the ICPI standard gradation specification for joint sand. Why is gradation important? Well, when a product meets the specification, it means that it features a good blend of strength and usability. For use as a jointing sand, this ensures that there will be a balance of large particles that are strong enough to endure traffic and small particles that will be able to get deep down into the joints. This blend of different sized particles also helps to minimize void space and create a densely packed material that provides great interlock as well as helping to increase the strength and water resistance of a polymeric sand. All Alliance Designer Products polymeric sands have been tested and meet the standard gradation specification for ASTM C-144. The bottom line: you can feel safe and confident using all of our polymeric sand products. If you have further questions on this topic, don’t hesitate to contact us!